A Fun-filled class… Our most popular learn-to-sail course. Our certified instructors will take you from landlubber to experienced sailor capable of handling a sailboat all by yourself. It is a hands-on class, spending 80 percent of your time on the water. You steer the boat and you trim the sails. Our training sessions are lively, interactive, and designed to help you retain the theory so it will always be there to enhance your sailing enjoyment on the water. We have classes structured for those who have never sailed, as well as, those who are looking to strengthen basic skills or to become certified. Small class sizes assure individualized attention (never more than three students per boat). A signed certificate of course completion to be mounted for all to see; complete with the Lanier Sailing Academy official seal. 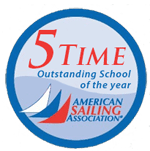 American Sailing Association Basic Keelboat 101 Certification. An official American Sailing Association log book to document your sailing experiences to charter companies and sailboat rental organizations. Eligibility to join our Sailing Clubs which provides you with unlimited usage of sailboat fleet, Clinics and year round social activities with your fellow sailors. “Sailing Made Easy”, the official American Sailing Association sailing text book. Access to an online e-course to aid your learning, as you prepare for class. A safety pamphlet from the U.S. Coast Guard. Instruction is aboard a 22′ day sailer with a certified instructor and a maximum of 3 students.